The water in St. Mary's Bay on Long Island in Nova Scotia, Canada remains calm as the mysterious Balancing Rock adorns the coastal shores. 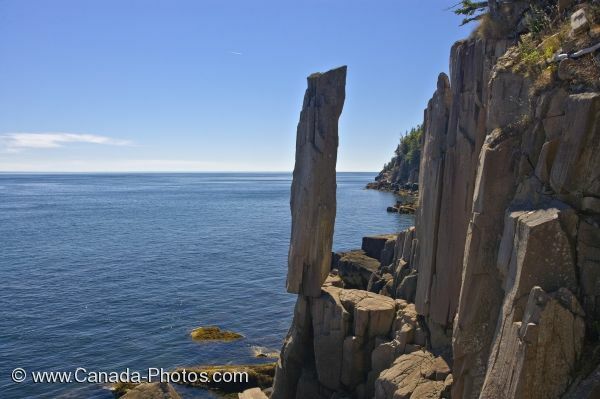 Many visitors to Nova Scotia, Canada who come to Long Island by ferry will stop and wander a trail which brings one to the beauty of St. Mary's Bay where the Balancing Rock stands. The trail makes its way through the woods, with boardwalks put in place in the sloppier areas and down towards the coastal shores, reaching the water's edge after descending 235 steps. Not an easy hike, but one that is unforgettable and worth the journey. The scenery of St. Mary's Bay is beautiful when standing on the platform with the unique rock formation known as Balancing Rock set off to the side. Scientists believe this rock has stood over the ocean for thousands of years, possibly millions and has never corroded enough to upset its positioning. Balancing Rock stands at a height of 9 meters and is a basalt rock formation, one of many which decorate the coastal shores of Long Island. This rock formation is the one that stands out the most due to its precarious position. Picture of the Balancing Rock along the Digby Neck and Islands Scenic Drive at St. Mary's Bay on Long Island, Nova Scotia.